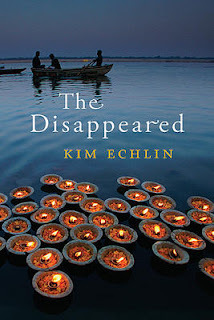 In The Disappeared by Kim Echlin, Anne, a Canadian teen, is in love with Serey, a Cambodian student who loves the blues. Anne and Serey have a few months together while Serey hangs around Montreal where Anne lives. Unable to return to Cambodia because the borders are closed, Serey waits and worries about his family. He doesn't know if they are living or dead, as his country suffers under the brutality of Pol Pot. When the borders open, Serey leaves Anne behind and she never hears from him again. Eleven years later, she believes she sees him on TV and drops everything to try to find him. What she finds in Camdodia, shocks her. This is a very short novel which is good because I don't know if I could have finished it otherwise. There were things I enjoyed about the book but the main character, Anne, annoyed me. She's a teen when she meets Serey and I felt that their relationship was more about lust than love. After he leaves, I can understand her moping around for awhile but... 11 years? She even rents his apartment years after he lived there. Then she takes off to Cambodia when she thinks she sees him on TV. When she gets there, she behaves in a reckless way that puts her friends in danger. I couldn't warm to her. She seems to live in a perpetual teenagehood. Serey was alright but I thought his attitude toward Anne's father was disrespectful. The characters I liked the most were Chan, Mau and Will. They all seemed like people with more sense. I guess if you can't love the lovers it's hard to love the book. The subject matter is pretty dark but this didn't bother me. I learned a lot reading about this horrible time in history. The Cambodian people suffering terribly. It broke my heart to read about how people lost their families, how simple country boys were recruited to become brutal killers. I couldn't imagine seeing bodies heaped in piles along the roads or burial grounds heaving because too many bodies lay there. I guess I'm a cranky lady because I couldn't buy the love story but other readers might. I did enjoy the historical aspect of the novel though. Thanks to Penguin.ca for the copy. Sorry this one didn't work for you. At least it has a great looking cover. sorry to hear this didn't work out for you! Its hard to love a book when you dislike the main characters and can't buy the love story. Thanks for the honest review. I also like the cover. Thanks for the honest review. I think I would be annoyed by the exact same things. That's too bad the story didn't work for you! It sounds exactly like something that would bother me, though! It has a nice cover, though! Bermuda & Serena- Yes, it is beautiful. Beth & Kailana- Yeah, I just couldn't get around it. It bugged me. I could see where Anne seems like she's flighty. I also don't buy a teenager holding out for the guy for eleven whole years. A few, maybe. And she seems obsessed if she just thinks she saw him and isn't even sure. Sorry it did not work for you. Sounded like it could be a good story. I'm sorry you found it a bit disappointing. It sounds interesting, though.